Sometimes it’s the little things that can make life easier. This post is actually a fork from the one which I originally wrote previously on a DPM issue. Shortly after that post, it was pointed out that I was reading DPM Priority Recommendations incorrectly. Indeed that was the case. My brief interpretation was that a higher recommendation meant a higher number (ie. priority 4 is a higher recommendation than priority 3). It’s actually the opposite that is true. A higher recommendation is a lower number. I believe there is too much left open to interpretation on the DPM screen as to what is higher and what is lower. The DRS configuration makes sense because it’s clear as to what is going to be applied; no definition of high or low to be (mis-)interpreted. The fix? Make the DPM configuration screen mirror DRS configuration screen. Development consistency goes a long way. As a frequent user of the tools, I expect it. I view UI inconsistency as sloppy. If you are a VMware DPM product manager, please see my previous post VMware DPM Issue. ESX 4.1, 32GB RAM, ~15% CPU utilization, ~65% Memory utilization, host DPM set for disabled meaning the host should never be placed in standby by DPM. ESXi 4.1, 24GB RAM, ~15% CPU utilization, ~65% Memory utilization, host DPM set for automatic meaning the host is always a candidate to be placed in standby by DPM. 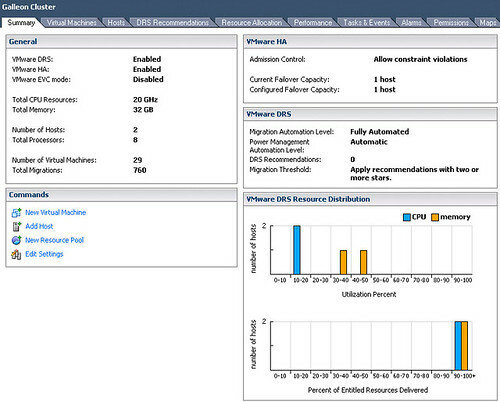 Up until recently, the ESX and ESXi hosts weren’t as loaded and DPM was working reliably. Each host had 16GB RAM installed. When aggregate load was light enough, all VMs were moved to the ESX host and the ESXi host was placed in standby mode by DPM. Life was good. There has been much activity in the lab recently. The ESX and ESXi host memory was upgraded to 32GB and 24GB respectively. 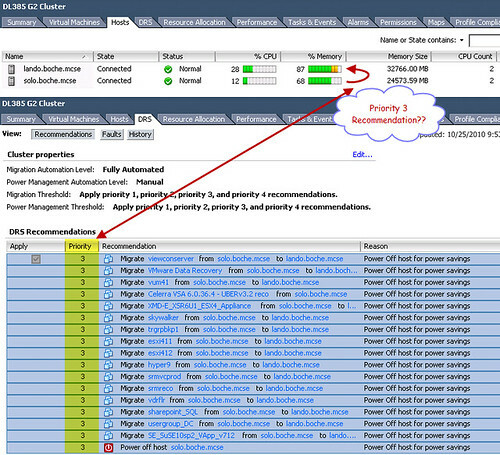 Many VMs were added to the cluster and powered on for various projects. The DPM configuration remained as is. Now what I’m noticing is that with a fairly heavy memory load on both hosts in cluster, DPM moves all VMs to the ESX host and places the ESXi host in standby mode. This places a tremendous amount of memory pressure and over commit on the solitary ESX host. This extreme condition is observed by the cluster and nearly as quickly, the ESXi host is taken back out of standby mode to balance the load. Then maybe about an hour later, the process repeats itself again. I then configured DPM to manual mode so that I could examine the recommendations being made by the calculator. The VMs were being evacuated for the purposes of DPM via a Priority 3 recommendation which is half way between Conservative and Aggressive recommendations. What is my conclusion? I’m surprised at the perceived increase in aggressiveness of DPM. In order to avoid the extreme memory over commit, I’ll need to configure DPM slide bar for Priority 2. In addition, I’d like to get a better understanding of the calculation. I have a difficult time believing the amount of memory over commit being deemed acceptable in a neutral configuration (Priority 3) which falls half way between conservative and aggressive. In addition to that, I’m not a fan of a host continuously entering and exiting standby mode, along with the flurry of vMotion activity which results. This tells me that the calculation isn’t accounting for the amount of memory pressure which is actually occurring once a host goes into standby mode, or coincidentally there are significant shifts in the workload patterns shortly after each DPM operation. If you are a VMware DPM product manager, please see my next post Request for UI Consistency. Here’s a tip that’s so simple and probably well known that it could be categorized as a stupid pet trick. As I’ve mentioned in the past, I leverage VMware DPM (an Enterprise licensing feature) in the lab so that during periods of lesser activity (while I’m at work or sleeping, or both), ESX hosts in the lab can be placed in standby mode to cut electricity consumption and save on the energy bill. I haven’t taken the time to research how hosts in the cluster are arbitrarily chosen for standby mode. Over the course of time, the pattern I have witnessed tells me it’s more of a round robin type selection. For instance, today host A will be chosen for standby mode, tomorrow host B will be chosen, and the next day, again host A will be chosen. Perhaps load is taken into the calculation. I don’t honestly know. It’s not important right now. 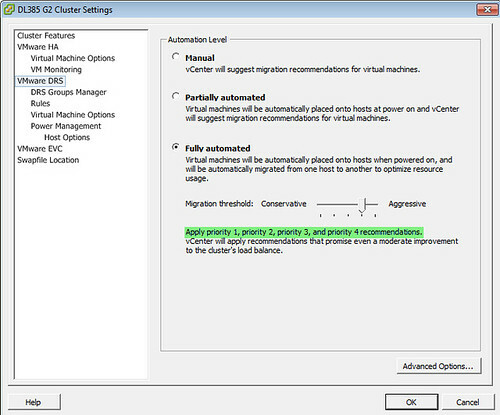 I’ve also mentioned in the past that I run both ESX and ESXi in the same vSphere cluster. 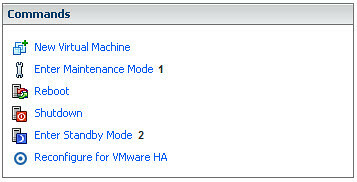 This is a VMware supported configuration. I do this so that I can get a daily dose of both host platform experiences. I’m not shy in saying my platform preference is still ESX because of its Service Console. What can I say… old habits are hard to break, but I’m trying, I really am. More often than not, I need ESX Service Console access for whatever reason. When I pop in the lab and find out that the ESX host is in standby mode, it takes a good 5 minutes to wake it up and then work on the things I need to get done. Enter DPM Host Options. This feature lets me apply some rules in the host selection process for DPM. 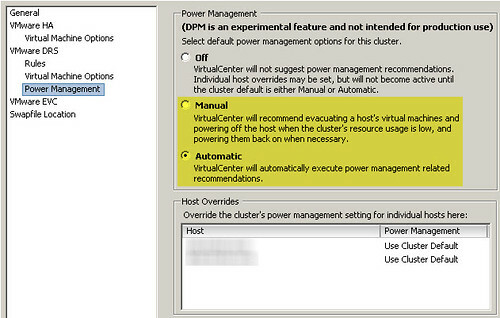 In this case, I want DPM to do its thing and save me money, but I don’t want it to shut down the ESX host. Rather, shut down the ESXi host instead. To do this is simple. 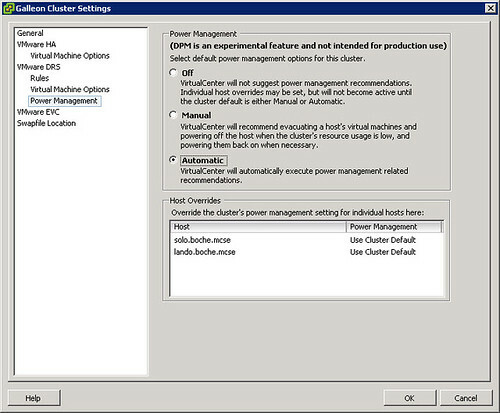 Modify the cluster settings and disable DPM for the ESX host as shown below. 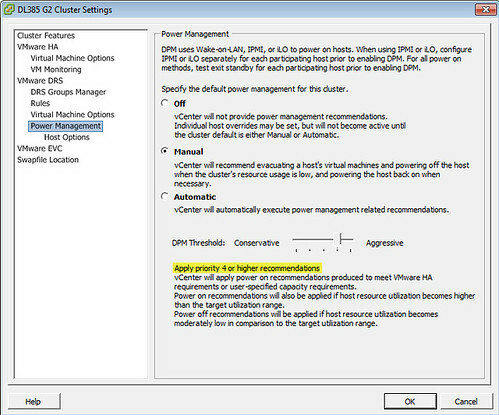 With this rule in place, DPM will always choose solo.boche.mcse for standby mode, which is the ESXi host. The ESX host, lando.boche.mcse, has been disabled for DPM and should always remained powered on and ready for action. I came home this afternoon from a Valentines Day wedding in North Dakota to find that my one and only workstation in the house (other than the work laptop) had a belated Valentines Day present for me: It would no longer boot up. No Windows. No POST. No video signal. No beep codes. I was feeling adventurous and I needed a relatively quick and inexpensive fix. 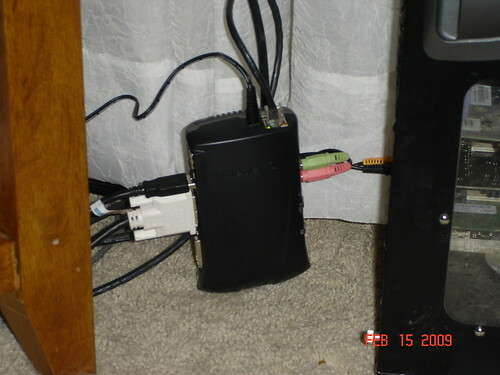 I decided to take one of the thin clients I received from Chip PC via VMworld 2008 plus a freshly deployed Windows XP template on the Virtual Infrastructure and promote this VDI solution to main household workstation status for the next few weeks. The timing on this could not have been better. The upcoming Minnesota VMUG on Wednesday March 11th is going to be VDI focused. I guess I’ll have more to contribute at that meeting than I had originally planned on. With any luck, Chip PC will be in attendance and we can discuss some things. 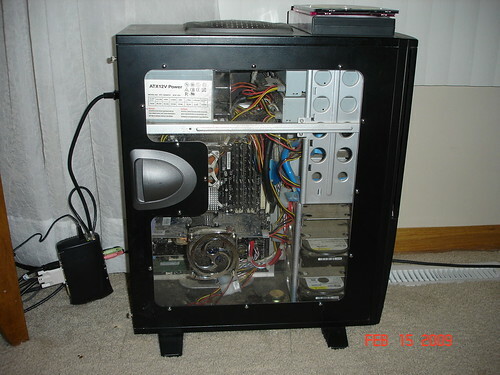 The thin client: Chip PC Xtreme PC NG-6600 (model: EX6600N, part number: CPN04209). Truth be told, this isn’t really a promotion in the sense that I had already performed extensive testing on it. I hadn’t even taken the thing out of the box yet other than to register it for the extended warranty. I’ve had only a little experience on these devices as I have an identical unit in the lab at work which I’ve spent a total of 30 minutes on. To the best of my knowledge, this is the Cadillac unit from Chip PC. I don’t have any fancy VDI brokering solutions here in the home lab and I’m not up to speed on VMware View so the plan is to leverage Thin Client -> RDP -> Windows XP desktop on VMware Virtual Infrastructure 3.5. I think this is going to be a good test. A trial by fire of VDI (granted, a fairly simple variation). I spout a lot about the goodness that is VMware and now I’ll be eating some of my own dog food from the desktop workspace. 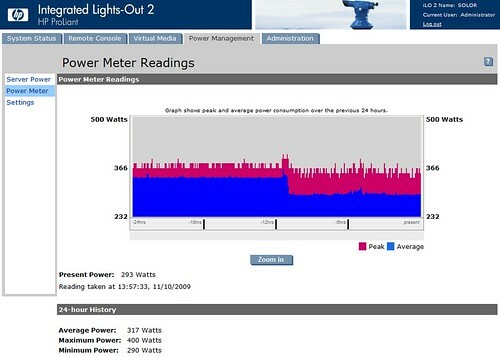 I’m a power user. I’ve got my standard set of applications that I use on a regular basis and I’ve got a few hardware devices such as a flatbed scanner, iPod Shuffle, USB thumb drives, digital cameras, etc. I should know within a short period of time whether or not this will be a viable solution for the short term. Also add to the mix my wife’s career. She uses our home computer to access her servers at work on a fairly regular basis. Lastly, my wife sometimes works from home while I’m away at the office or traveling. It’s going to be critical that this solution stays up and running and continues to be viable for my wife while I’m remote and not able to provide computer support. So what else? 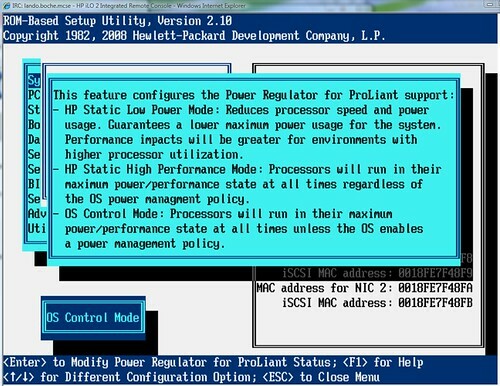 As long as I’m throwing caution to the wind, I think it’s time to take the training wheels off VMware DPM (Distributed Power Management) and see what happens in a two node cluster. Based on the environment below, what do you think will happen? CPU load is very low, however, memory utilization is close to being over committed in a one host scenario. Will DPM kick in? No matter what the outcome, vmwarenews.de aka Roman Haug – you are no longer welcomed to republish my blog articles. Albeit flattering, the fact that you have not even so much as asked in the first place has officially pissed me off. You publish my content as if it were your own, written by you as indicated by the “by Roman” header preceeding each duplicated post. Please remove my content from your site and refrain from syndicating my content going forward. Thank you in advance. Update: Roman Haug has offered an apology and I believe we have reached an understanding. Thank you Roman!